FM traffic and packet radio from the AO-27 amateur radio satellite. I made this recording last Saturday while testing the Gqrx software receiver using the cross yagis at OZ7SAT and the Funcube Dongle. 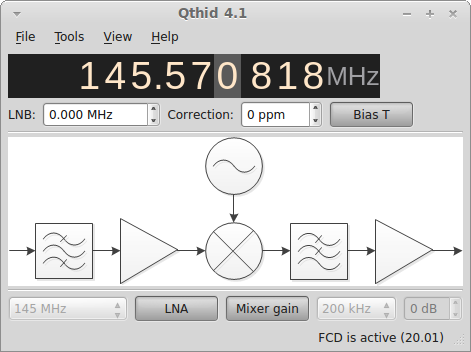 Gqrx / C++ update June 4, 2011: After establishing the basic framework for a GNU Radio receiver written in C++ it was time to start working on the GUI framework. 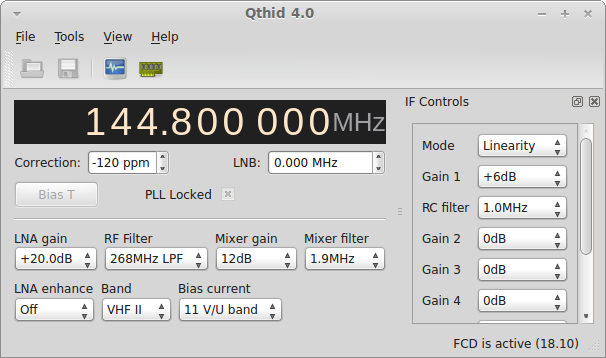 As you may recall the GUI will be written in Qt and I am hoping that it will simplify porting the application to Mac OS X.
Qthid is simple cross platform controller application for the Funcube Dongle Pro and Pro+ software defined radio receivers. It is written using the HID API library and the Qt GUI toolkit. It is a fork and evolution of the qthid002.zip package by Howard Long, G6LVB, available on the Funcube Dongle download page. Qthid is free (libre) software licensed under the GNU General Public License. This allows you to copy, modify and distribute the software without any restrictions, provided that your modification are distributed under a compatible license. Change frequency and apply frequency correction. Change RF gains and filters. Change IF gains and filters. LNA enhancement, bias current, etc. Auto-repeat tuning buttons (click and hold button to scan). Upgrade and verify the firmware. The crashes and freezes in the original qthid002 have been eliminated (I hope). Tested on Mac OS X and Linux (32 and 64 bit). Use of v3.0 and later requires firmware 18f or later. Use v2.2 to upgrade earlier firmwares. Works on Mac OS X 10.7 Lion and Windows 7. There is also a quick-hack release v4.1 that supports the new Funcube Dongle Pro+ devices. This does not work with the original Funcube Dongle Pro! If you are using Debian or Ubuntu Linux you can try to install the Debian package available for wheezy (testing) or sid (unstable). These packages contain everything to set up and configure your Funcube Dongle. For other systems you can try my pre-compiled binary packages available in the download section at SourceForge. You will also find source packages there. Regardless of which option you try, be sure to read the README.txt file. If you have a Github account you can fork it directly in Github and our repositories will be part of the same network. See the Pro Git manual for other awesome things you can do with the git repository. I recommend to use the FCDevelopment Yahoo group if you have an original Pro device or the FCD Pro Plus Yahoo group if you have the newer Pro+ device. Pretty much everybody who knows something about the Funcube Dongle and the software API is there. Alternatively, you can post a comment to this page. I any case I prefer public forum for troubleshooting so that there is a record for future reference.